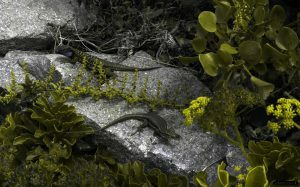 While on holiday in Tenerife I managed to snap a few of the local lizards with my UV camera. Unfortunately I only had a 35mm lens with me (Novoflex Noflexar), so had to be very close to the lizards and the most colourful big males were too shy to let me get within a metre or so. But I did manage to snap a few. The dusky blue patches on the cheeks and flanks of the males have quite intense UV reflection and really stand out in UV-vision. This highlights the covert sexual signalling of the lizards, where their bright colours are more conspicuous to potential mates than to potential predators (Kate recently published a cool paper on this in her Aegean wall lizards). The photos were all processed using my image analysis toolbox. Two Tenerife lizards (Gallotia galloti) basking. The image on the left is in human-visible colours and although the male at the top is more colourful than the female at the bottom, he is still fairly well camouflaged amongst the foliage. However, the dusky blue/grey patches on his cheek and bars on his flank are much more conspicuous to the female lizard than ourselves, as highlighted in the false colour UV image on the right. This demonstrates how colours can be used as private signals in some species where evolutionary pressures for sexual signalling compete with evading predators. A male Tenerife lizard (Gallotia galloti). Again, the blue patch is more conspicuous to lizard vision (right) than human vision (left). Lizard in dog vision. This is how the lizards would look to most mammals or red-green colour-blind humans. The blue flank of the lizard is quite visible, but the red foliage is completely invisible. Lizard in bluetit longwave, mediumwave and shortwave in place of RGB. This is similar to human LMS, but notice the colours are slightly more saturated. This is because of their spectral tuning of their receptors, giving them better colour vision. Lizard in bluetit mediumwave, shortwave and ultraviolet in place of RGB. 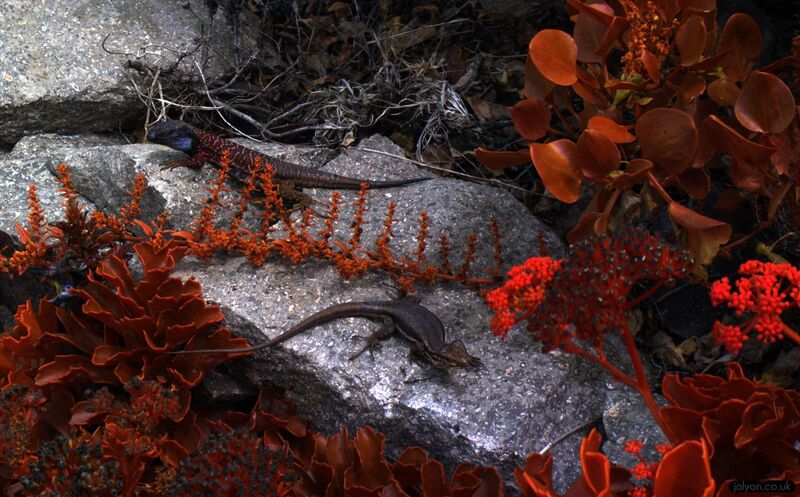 The flanks of the male lizard are highly visible and blue in this image, meaning they are highly UV reflective. Lizards in jumping spider vision. Some jumping spiders can see in red, green and ultraviolet ranges, a large spectral range for any animal.